26.1.1: When did MySQL 5.0 become production-ready (GA)? 26.1.2: Can MySQL 5.0 do subqueries? 26.1.3: Can MySQL 5.0 peform multiple-table inserts, updates, and deletes? 26.1.4: Does MySQL 5.0 have a Query Cache? Does it work on Server, Instance or Database? 26.1.5: Does MySQL 5.0 have Sequences? 26.1.6: Does MySQL 5.0 have a NOW() function with fractions of seconds? 26.1.7: Does MySQL 5.0 work with multi-core processors? 26.1.8: Is there a hot backup tool for MyISAM like InnoDB Hot Backup? 26.1.9: Have there been there any improvements in error reporting when foreign keys fail? Does MySQL now report which column and reference failed? 26.1.10: Can MySQL 5.0 perform ACID transactions? MySQL 5.0.15 was released for production use on 19 October 2005. We are now working on MySQL 5.1, which is currently in beta. Yes. See Section 13.2.8, “Subquery Syntax”. Yes. For the syntax required to perform multiple-table updates, see Section 13.2.10, “UPDATE Syntax”; for that required to perform multiple-table deletes, see Section 13.2.1, “DELETE Syntax”. A multiple-table insert can be accomplished using a trigger whose FOR EACH ROW clause contains multiple INSERT statements within a BEGIN ... END block. See Section 18.3, “Using Triggers”. Yes. The query cache operates on the server level, caching complete result sets matched with the original query string. If an exactly identical query is made (which often happens, particularly in web applications), no parsing or execution is necessary; the result is sent directly from the cache. Various tuning options are available. See Section 5.13, “The MySQL Query Cache”. No. However, MySQL has an AUTO_INCREMENT system, which in MySQL 5.0 can also handle inserts in a multi-master replication setup. With the --auto-increment-increment and --auto-increment-offset startup options, you can set each server to generate auto-increment values that don't conflict with other servers. The --auto-increment-increment value should be greater than the number of servers, and each server should have a unique offset. No. This is on the MySQL roadmap as a “rolling feature”. This means that it is not a flagship feature, but will be implemented, development time permitting. Specific customer demand may change this scheduling. However, MySQL does parse time strings with a fractional component. See Section 11.3.2, “The TIME Type”. This is currently under development for a future MySQL release. The foreign key support in InnoDB has seen improvements in each major version of MySQL. Foreign key support generic to all storage engines is scheduled for MySQL 5.2; this should resolve any inadequacies in the current storage engine specific implementation. Yes. All current MySQL versions support transactions. The InnoDB storage engine offers full ACID transactions with row-level locking, multi-versioning, non-locking repeatable reads, and all four SQL standard isolation levels. 26.2.1: Where can I obtain complete documentation for MySQL storage engines? 26.2.2: Are there any new storage engines in MySQL 5.0? 26.2.3: Have any storage engines been removed in MySQL 5.0? 26.2.4: What are the unique benefits of the ARCHIVE storage engine? 26.2.5: Do the new features in MySQL 5.0 apply to all storage engines? See Chapter 14, Storage Engines. That chapter contains information about all MySQL storage engines except for the NDB storage engine used for MySQL Cluster; NDB is covered in Chapter 15, MySQL Cluster. 26.3.1: What are server SQL modes? 26.3.2: How many server SQL modes are there? 26.3.3: How do you determine the server SQL mode? 26.3.4: Is the mode dependent on the database or connection? 26.3.5: Can the rules for strict mode be extended? 26.3.6: Does strict mode impact performance? 26.3.7: What is the default server SQL mode when My SQL 5.0 is installed? Server SQL modes define what SQL syntax MySQL should support and what kind of data validation checks it should perform. This makes it easier to use MySQL in different environments and to use MySQL together with other database servers. The MySQL Server apply these modes individually to different clients. For more information, see Section 5.2.6, “SQL Modes”. Each mode can be independently switched on and off. See Section 5.2.6, “SQL Modes”, for a complete list of available modes. You can set the default SQL mode (for mysqld startup) with the --sql-mode option. Using the statement SET [SESSION|GLOBAL] sql_mode='modes', you can change the settings from within a connection, either locally to the connection, or to take effect globally. You can retrieve the current mode by issuing a SELECT @@sql_mode statement. A mode is not linked to a particular database. Modes can be set locally to the session (connection), or globally for the server. you can change these settings using SET [SESSION|GLOBAL] sql_mode='modes'. When we refer to strict mode, we mean a mode where at least one of the modes TRADITIONAL, STRICT_TRANS_TABLES, or STRICT_ALL_TABLES is enabled. Options can be combined, so you can add additional restrictions to a mode. See Section 5.2.6, “SQL Modes”, for more information. The intensive validation of input data that some settings requires more time than if the validation is not done. While the performance impact is not that great, if you do not require such validation (perhaps your application already handles all of this), then MySQL gives you the option of leaving strict mode disabled. However — if you do require it — strict mode can provide such validation. By default, no special modes are enabled. See Section 5.2.6, “SQL Modes”, for information about all available modes and MySQL's default behavior. 26.4.1: Does MySQL 5.0 support stored procedures? 26.4.2: Where can I find documentation for MySQL stored procedures and stored functions? 26.4.3: Is there a discussion forum for MySQL stored procedures? 26.4.4: Where can I find the ANSI SQL 2003 specification for stored procedures? 26.4.5: How do you manage stored routines? 26.4.6: Is there a way to view all stored procedures and stored functions in a given database? 26.4.7: Where are stored procedures stored? 26.4.8: Is it possible to group stored procedures or stored functions into packages? 26.4.9: Can a stored procedure call another stored procedure? 26.4.10: Can a stored procedure call a trigger? 26.4.11: Can a stored procedure access tables? 26.4.12: Do stored procedures have a statement for raising application errors? 26.4.13: Do stored procedures provide exception handling? 26.4.14: Can MySQL 5.0 stored routines return result sets? 26.4.15: Is WITH RECOMPILE supported for stored procedures? 26.4.16: Is there a MySQL equivalent to using mod_plsql as a gateway on Apache to talk directly to a stored procedure in the database? 26.4.17: Can I pass an array as input to a stored procedure? 26.4.18: Can I pass a cursor as an IN parameter to a stored procedure? 26.4.19: Can I return a cursor as an OUT parameter from a stored procedure? 26.4.20: Can I print out a variable's value within a stored routine for debugging purposes? 26.4.21: Can I commit or roll back transactions inside a stored procedure? 26.4.22: Do MySQL 5.0 stored procedures and functions work with replication? 26.4.23: Are stored procedures and functions created on a master server replicated to a slave? 26.4.24: How are actions that take place inside stored procedures and functions replicated? 26.4.25: Are there special security requirements for using stored procedures and functions together with replication? 26.4.26: What limitations exist for replicating stored procedure and function actions? 26.4.27: Do the preceding limitations affect MySQL's ability to do point-in-time recovery? 26.4.28: What is being done to correct the aforementioned limitations? Yes. MySQL 5.0 supports two types of stored routines — stored procedures and stored functions. See Chapter 17, Stored Procedures and Functions. Unfortunately, the official specifications are not freely available (ANSI makes them available for purchase). However, there are books — such as SQL-99 Complete, Really by Peter Gulutzan and Trudy Pelzer — which give a comprehensive overview of the standard, including coverage of stored procedures. It is always good practice to use a clear naming scheme for your stored routines. You can manage stored procedures with CREATE [FUNCTION|PROCEDURE], ALTER [FUNCTION|PROCEDURE], DROP [FUNCTION|PROCEDURE], and SHOW CREATE [FUNCTION|PROCEDURE]. You can obtain information about existing stored procedures using the ROUTINES table in the INFORMATION_SCHEMA database (see Section 20.14, “The INFORMATION_SCHEMA ROUTINES Table”). For more information, see Section 20.14, “The INFORMATION_SCHEMA ROUTINES Table”. The body of a stored routine can be viewed using SHOW CREATE FUNCTION (for a stored function) or SHOW CREATE PROCEDURE (for a stored procedure). See Section 13.5.4.5, “SHOW CREATE PROCEDURE and SHOW CREATE FUNCTION Syntax”, for more information. In the proc table of the mysql system database. However, you should not access the tables in the system database directly. Instead, use SHOW CREATE FUNCTION to obtain information about stored functions, and SHOW CREATE PROCEDURE to obtain information about stored procedures. See Section 13.5.4.5, “SHOW CREATE PROCEDURE and SHOW CREATE FUNCTION Syntax”, for more information about these statements. You can also query the ROUTINES table in the INFORMATION_SCHEMA database — see Section 20.14, “The INFORMATION_SCHEMA ROUTINES Table”, for information about this table. No. This is not supported in MySQL 5.0. A stored procedure can execute an SQL statement, such as an UPDATE, that causes a trigger to fire. Not in MySQL 5.0. We intend to implement the SQL standard SIGNAL and RESIGNAL statements in a future MySQL release. MySQL implements HANDLER definitions according to the SQL standard. See Section 17.2.8.2, “DECLARE Handlers”, for details. Stored procedures can, but stored functions cannot. If you perform an ordinary SELECT inside a stored procedure, the result set is returned directly to the client. You need to use the MySQL 4.1 (or above) client-server protocol for this to work. This means that — for instance — in PHP, you need to use the mysqli extension rather than the old mysql extension. There is no equivalent in MySQL 5.0. In MySQL 5.0, cursors are available inside stored procedures only. In MySQL 5.0, cursors are available inside stored procedures only. However, if you do not open a cursor on a SELECT, the result will be sent directly to the client. You can also SELECT INTO variables. See Section 13.2.7, “SELECT Syntax”. Yes, you can do this in a stored procedure, but not in a stored function. If you perform an ordinary SELECT inside a stored procedure, the result set is returned directly to the client. You will need to use the MySQL 4.1 (or above) client-server protocol for this to work. This means that — for instance — in PHP, you need to use the mysqli extension rather than the old mysql extension. Yes, standard actions carried out in stored procedures and functions are replicated from a master MySQL server to a slave server. There are a few limitations that are described in detail in Section 17.4, “Binary Logging of Stored Routines and Triggers”. Non-deterministic (random) or time-based actions embedded in stored procedures may not replicate properly. By their very nature, randomly produced results are not predictable and cannot be exactly reproduced, and therefore, random actions replicated to a slave will not mirror those performed on a master. Note that declaring stored functions to be DETERMINISTIC or setting the log_bin_trust_function_creators system variable to 0 will not allow random-valued operations to be invoked. Finally, non-transactional tables for which errors occur during large DML actions (such as bulk inserts) may experience replication issues in that a master may be partially updated from DML activity, but no updates are done to the slave because of the errors that occurred. A workaround is for a function's DML actions to be carried out with the IGNORE keyword so that updates on the master that cause errors are ignored and updates that do not cause errors are replicated to the slave. 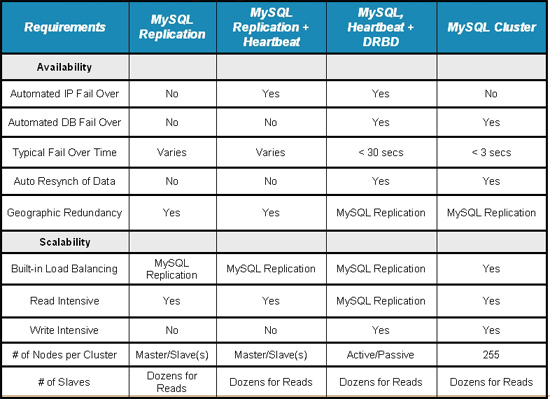 MySQL 5.1 implements row-based replication, which resolves the limitations mentioned earlier. We do not plan to backport row-based replication to MySQL 5.0. For additional information, see Row-Based Replication, in the MySQL 5.1 Manual. 26.5.1: Where can I find the documentation for MySQL 5.0 triggers? 26.5.2: Is there a discussion forum for MySQL Triggers? 26.5.3: Does MySQL 5.0 have statement-level or row-level triggers? 26.5.4: Are there any default triggers? 26.5.5: How are triggers managed in MySQL? 26.5.6: Is there a way to view all triggers in a given database? 26.5.7: Where are triggers stored? 26.5.8: Can a trigger call a stored procedure? 26.5.9: Can triggers access tables? 26.5.10: Can triggers call an external application through a UDF? 26.5.11: Is possible for a trigger to update tables on a remote server? 26.5.12: Do triggers work with replication? 26.5.13: How are actions carried out through triggers on a master replicated to a slave? Yes. It is available at http://forums.mysql.com/list.php?99. In MySQL 5.0, all triggers are FOR EACH ROW — that is, the trigger is activated for each row that is inserted, updated, or deleted. MySQL 5.0 does not support triggers using FOR EACH STATEMENT. In MySQL 5.0, triggers can be created using the CREATE TRIGGER statement, and dropped using DROP TRIGGER. See Section 18.1, “CREATE TRIGGER Syntax”, and Section 18.2, “DROP TRIGGER Syntax”, for more about these statements. Information about triggers can be obtained by querying the INFORMATION_SCHEMA.TRIGGERS table. See Section 20.16, “The INFORMATION_SCHEMA TRIGGERS Table”. For more information about this table, see Section 20.16, “The INFORMATION_SCHEMA TRIGGERS Table”. You can also use the SHOW TRIGGERS statement, which is specific to MySQL. See Section 13.5.4.26, “SHOW TRIGGERS Syntax”. Triggers are currently stored in .TRG files, with one such file one per table. In other words, a trigger belongs to a table. In the future, we plan to change this so that trigger information will be included in the .FRM file that defines the structure of the table. We also plan to make triggers database-level objects — rather than table-level objects as they are now — to bring them into compliance with the SQL standard. A trigger can access both old and new data in its own table. Through a stored procedure, or a multiple-table update or delete statement, a trigger can also affect other tables. Yes. A table on a remote server could be updated using the FEDERATED storage engine. (See Section 14.7, “The FEDERATED Storage Engine”). Triggers and replication in MySQL 5.0 work in the same wasy as in most other database engines: Actions carried out through triggers on a master are not replicated to a slave server. Instead, triggers that exist on tables that reside on a MySQL master server need to be created on the corresponding tables on any MySQL slave servers so that the triggers activate on the slaves as well as the master. 26.6.1: Where can I find documentation for MySQL Views? 26.6.2: Is there a discussion forum for MySQL Views? 26.6.3: What happens to a view if an underlying table is dropped or renamed? 26.6.4: Does MySQL 5.0 have table snapshots? 26.6.5: Does MySQL 5.0 have materialized views? 26.6.6: Can you insert into views that are based on joins? It is possible, provided that your INSERT statement has a column list that makes it clear there's only one table involved. You cannot insert into multiple tables with a single insert on a view. 26.7.1: Where can I find documentation for the MySQL INFORMATION_SCHEMA database? 26.7.2: Is there a discussion forum for INFORMATION_SCHEMA? 26.7.3: Where can I find the ANSI SQL 2003 specification for INFORMATION_SCHEMA? 26.7.4: What is the difference between the Oracle Data Dictionary and MySQL's INFORMATION_SCHEMA? 26.7.5: Can I add to or otherwise modify the tables found in the INFORMATION_SCHEMA database? Unfortunately, the official specifications are not freely available. (ANSI makes them available for purchase.) However, there are books available — such as SQL-99 Complete, Really by Peter Gulutzan and Trudy Pelzer — which give a comprehensive overview of the standard, including INFORMATION_SCHEMA. Both Oracle and MySQL provide metadata in tables. However, Oracle and MySQL use different table names and column names. MySQL's implementation is more similar to those found in DB2 and SQL Server, which also support INFORMATION_SCHEMA as defined in the SQL standard. No. Since applications may rely on a certain standard structure, this should not be modified. For this reason, MySQL AB cannot support bugs or other issues which result from modifying INFORMATION_SCHEMA tables or data. 26.8.1: Where can I find information on how to migrate from MySQL 4.1 to MySQL 5.0? 26.8.2: How has storage engine (table type) support changed in MySQL 5.0 from previous versions? For detailed upgrade information, see Section 2.4.16, “Upgrading MySQL”. We recommend that you do not skip a major version when upgrading, but rather complete the process in steps, upgrading from one major version to the next in each step. This may seem more complicated, but it will you save time and trouble — if you encounter problems during the upgrade, their origin will be easier to identify, either by you or — if you have a MySQL Network subscription — by MySQL support. 26.9.1: Where can I find documentation that addresses security issues for MySQL? 26.9.2: Does MySQL 5.0 have native support for SSL? 26.9.3: Is SSL support be built into MySQL binaries, or must I recompile the binary myself to enable it? 26.9.4: Does MySQL 5.0 have built-in authentication against LDAP directories? 26.9.5: Does MySQL 5.0 include support for Roles Based Access Control (RBAC)? The best place to start is Section 5.6, “General Security Issues”. Section 5.6.1, “General Security Guidelines”. Section 5.6.2, “Making MySQL Secure Against Attackers”. Section B.1.4.1, “How to Reset the Root Password”. Section 5.6.5, “How to Run MySQL as a Normal User”. Section 24.2.4.6, “User-Defined Function Security Precautions”. Section 5.6.3, “Security-Related mysqld Options”. Section 5.6.4, “Security Issues with LOAD DATA LOCAL”. Section 2.4.15, “Post-Installation Setup and Testing”. Section 5.8.7.1, “Basic SSL Concepts”. MySQL Enterprise The MySQL Network Monitoring and Advisory Service enforces best practices for maximizing the security of your servers. For more information see http://www.mysql.com/products/enterprise/advisors.html. Most 5.0 binaries have support for SSL connections between the client and server. We can't currently build with the new YaSSL library everywhere, as it's still quite new and does not compile on all platforms yet. See Section 5.8.7, “Using Secure Connections”. You can also tunnel a connection via SSH, if (for instance) if the client application doesn't support SSL connections. For an example, see Section 5.8.7.5, “Connecting to MySQL Remotely from Windows with SSH”. Most 5.0 binaries have SSL enabled for client-server connections that are secured, authenticated, or both. However, the YaSSL library currently does not compile on all platforms. See Section 5.8.7, “Using Secure Connections”, for a complete listing of supported and unsupported platforms. No. Support for external authentication methods is on the MySQL roadmap as a “rolling feature”, which means that we plan to implement it in the future, but we have not yet determined when this will be done. No. Support for roles is on the MySQL roadmap as a “rolling feature”, which means that we plan to implement it in the future, but we have not yet determined when this will be done. In the following section, we provide answers to questions that are most frequently asked about MySQL Cluster and the NDB storage engine. 26.10.1: What does “NDB” mean? 26.10.2: What's the difference in using Cluster vs using replication? 26.10.3: Do I need to do any special networking to run Cluster? How do computers in a cluster communicate? 26.10.4: How many computers do I need to run a cluster, and why? 26.10.5: What do the different computers do in a MySQL Cluster? 26.10.6: With which operating systems can I use Cluster? 26.10.7: What are the hardware requirements for running MySQL Cluster? 26.10.8: How much RAM do I need? Is it possible to use disk memory at all? 26.10.9: What filesystems can I use with MySQL Cluster? What about network filesystems or network shares? 26.10.10: Can I run MySQL Cluster nodes inside virtual machines (such as those created by VMWare, Parallels, or Xen)? 26.10.12: MySQL Cluster uses TCP/IP. Does this mean that I can run it over the Internet, with one or more nodes in remote locations? 26.10.13: Do I have to learn a new programming or query language to use MySQL Cluster? 26.10.14: How do I find out what an error or warning message means when using MySQL Cluster? 26.10.15: Is MySQL Cluster transaction-safe? What isolation levels are supported? 26.10.16: What storage engines are supported by MySQL Cluster? 26.10.17: Which versions of the MySQL software support Cluster? Do I have to compile from source? 26.10.18: In the event of a catastrophic failure — say, for instance, the whole city loses power and my UPS fails — would I lose all my data? 26.10.19: Is it possible to use FULLTEXT indexes with Cluster? 26.10.20: Can I run multiple nodes on a single computer? 26.10.21: Can I add nodes to a cluster without restarting it? 26.10.22: Are there any limitations that I should be aware of when using MySQL Cluster? 26.10.23: How do I import an existing MySQL database into a cluster? 26.10.24: How do cluster nodes communicate with one another? 26.10.25: What is an arbitrator? 26.10.26: What data types are supported by MySQL Cluster? 26.10.27: How do I start and stop MySQL Cluster? 26.10.28: What happens to cluster data when the cluster is shut down? 26.10.29: Is it helpful to have more than one management node for a cluster? 26.10.30: Can I mix different kinds of hardware and operating systems in one MySQL Cluster? 26.10.31: Can I run two data nodes on a single host? Two SQL nodes? 26.10.32: Can I use hostnames with MySQL Cluster? 26.10.33: How do I handle MySQL users in a Cluster having multiple MySQL servers? This stands for “Network Database”. NDB (also known as NDB Cluster or NDBCLUSTER) is the storage engine that enables clustering in MySQL. In a replication setup, a master MySQL server updates one or more slaves. Transactions are committed sequentially, and a slow transaction can cause the slave to lag behind the master. This means that if the master fails, it is possible that the slave might not have recorded the last few transactions. If a transaction-safe engine such as InnoDB is being used, a transaction will either be complete on the slave or not applied at all, but replication does not guarantee that all data on the master and the slave will be consistent at all times. In MySQL Cluster, all data nodes are kept in synchrony, and a transaction committed by any one data node is committed for all data nodes. In the event of a data node failure, all remaining data nodes remain in a consistent state. In short, whereas standard MySQL replication is asynchronous, MySQL Cluster is synchronous. We have implemented (asynchronous) replication for Cluster in MySQL 5.1. This includes the capability to replicate both between two clusters, and from a MySQL cluster to a non-Cluster MySQL server. However, we do not plan to backport this functionality to MySQL 5.0. MySQL Cluster is intended to be used in a high-bandwidth environment, with computers connecting via TCP/IP. Its performance depends directly upon the connection speed between the cluster's computers. The minimum connectivity requirements for Cluster include a typical 100-megabit Ethernet network or the equivalent. We recommend you use gigabit Ethernet whenever available. The faster SCI protocol is also supported, but requires special hardware. See Section 15.10, “Using High-Speed Interconnects with MySQL Cluster”, for more information about SCI. A minimum of three computers is required to run a viable cluster. However, the minimum recommended number of computers in a MySQL Cluster is four: one each to run the management and SQL nodes, and two computers to serve as data nodes. The purpose of the two data nodes is to provide redundancy; the management node must run on a separate machine to guarantee continued arbitration services in the event that one of the data nodes fails. To provide increased throughput and high availability, you should use multiple SQL nodes (MySQL Servers connected to the cluster). It is also possible (although not strictly necessary) to run multiple management servers. Management node (MGM node): Provides management services for the cluster as a whole, including startup, shutdown, backups, and configuration data for the other nodes. The management node server is implemented as the application ndb_mgmd; the management client used to control MySQL Cluster via the MGM node is ndb_mgm. Data node: Stores and replicates data. Data node functionality is handled by an instance of the NDB data node process ndbd. SQL node: This is simply an instance of MySQL Server (mysqld) that is built with support for the NDB Cluster storage engine and started with the --ndb-cluster option to enable the engine. MySQL Cluster is supported on most Unix-like operating systems, including Linux, Mac OS X, Solaris, BSD, HP-UX, AIX, and IRIX, among others, as well as Novell Netware. Cluster is not supported for Windows at this time. However, we are working to add Cluster support for other platforms, including Windows, and our goal is to offer MySQL Cluster on all platforms for which MySQL itself is supported. For more detailed information concerning the level of support which is offered for MySQL Cluster on various operating system versions, OS distributions, and hardware platforms, please refer to http://www.mysql.com/support/supportedplatforms/cluster.html. Cluster should run on any platform for which NDB-enabled binaries are available. Naturally, faster CPUs and more memory will improve performance, and 64-bit CPUs will likely be more effective than 32-bit processors. There must be sufficient memory on machines used for data nodes to hold each node's share of the database (see How much RAM do I Need? for more information). Nodes can communicate via a standard TCP/IP network and hardware. For SCI support, special networking hardware is required. In MySQL-5.0, Cluster is in-memory only. This means that all table data (including indexes) is stored in RAM. Therefore, if your data takes up 1GB of space and you want to replicate it once in the cluster, you need 2GB of memory to do so (1 GB per replica). This is in addition to the memory required by the operating system and any applications running on the cluster computers. If a data node's memory usage exceeds what is available in RAM, then the system will attempt to use swap space up to the limit set for DataMemory. However, this will at best result in severely degraded performance, and may cause the node to be dropped due to slow response time (missed heartbeats). We do not recommend on relying on disk swapping in a production environment for this reason. In any case, once the DataMemory limit is reached, any operations requiring additional memory (such as inserts) will fail. Each primary key or hash index created for an NDBCluster table requires 21–25 bytes per record. These indexes use IndexMemory. Each ordered index requires 10 bytes storage per record, using DataMemory. A primary key or unique index on a Cluster table normally takes up 31 to 35 bytes per record. However, if the primary key or unique index is created with USING HASH, then it requires only 21 to 25 bytes per record. Note that creating MySQL Cluster tables with USING HASH for all primary keys and unique indexes will generally cause table updates to run more quickly — in some cases by a much as 20 to 30 percent faster than updates on tables where USING HASH was not used in creating primary and unique keys. This is due to the fact that less memory is required (because no ordered indexes are created), and that less CPU must be utilized (because fewer indexes must be read and possibly updated). However, it also means that queries that could otherwise use range scans must be satisfied by other means, which can result in slower selects. When calculating Cluster memory requirements, you may find useful the ndb_size.pl utility which is available in recent MySQL 5.0 releases. This Perl script connects to a current (non-Cluster) MySQL database and creates a report on how much space that database would require if it used the NDBCluster storage engine. For more information, see Section 15.9.14, “ndb_size.pl — NDBCluster Size Requirement Estimator”. It is especially important to keep in mind that every MySQL Cluster table must have a primary key. The NDB storage engine creates a primary key automatically if none is defined, and this primary key is created without USING HASH. There is no easy way to determine exactly how much memory is being used for storage of Cluster indexes at any given time; however, warnings are written to the Cluster log when 80% of available DataMemory or IndexMemory is in use, and again when use reaches 85%, 90%, and so on. Generally, any filesystem that is native to the host operating system should work well with MySQL Cluster. If you find that a given filesystem works particularly well (or not so especially well) with MySQL Cluster, we invite you to discuss your findings in the MySQL Cluster Forums. We do not test MySQL Cluster with FAT or VFAT filesystems on Linux. Because of this, and due to the fact that these are not very useful for any purpose other than sharing disk partitions between Linux and Windows operating systems on multi-boot computers, we do not recommend their use with MySQL Cluster. MySQL Cluster is implemented as a shared-nothing solution; the idea behind this is that the failure of a single piece of hardware should not cause the failure of multiple cluster nodes, or possibly even the failure of the cluster as a whole. For this reason, the use of network shares or network filesystems is not supported for MySQL Cluster. This also applies to shared storage devices such as SANs. This is possible but not recommended for a production environment. We have found that running MySQL Cluster processes inside a virtual machine can give rise to issues with timing and disk subsystems that have a strong negative impact on the operation of the cluster. The behavior of the cluster is often unpredictable in these cases. If the issue can be reproduced outside the virtual environment, then we may be able to provide assistance. Otherwise, we cannot support it at this time. The cause is very likely to be that your setup does not provide sufficient RAM for all table data and all indexes, including the primary key required by the NDB storage engine and automatically created in the event that the table definition does not include the definition of a primary key. It is also worth noting that all data nodes should have the same amount of RAM, since no data node in a cluster can use more memory than the least amount available to any individual data node. In other words, if there are four computers hosting Cluster data nodes, and three of these have 3GB of RAM available to store Cluster data while the remaining data node has only 1GB RAM, then each data node can devote only 1GB to clustering. It is very unlikely that a cluster would perform reliably under such conditions, as MySQL Cluster was designed and implemented with the assumption that it would be run under conditions guaranteeing dedicated high-speed connectivity such as that found in a LAN setting using 100 Mbps or gigabit Ethernet — preferably the latter. We neither test nor warrant its performance using anything slower than this. Some specialized configuration parameters and files are required to set up a MySQL Cluster — see Section 15.4.4, “Configuration File”, for information about these. A few simple commands are used in the MySQL Cluster management client for tasks such as starting and stopping cluster nodes. See Section 15.7.2, “Commands in the MySQL Cluster Management Client”. From within the mysql client, use SHOW ERRORS or SHOW WARNINGS immediately upon being notified of the error or warning condition. Errors and warnings also be displayed in MySQL Query Browser. From a system shell prompt, use perror --ndb error_code. Yes: For tables created with the NDB storage engine, transactions are supported. In MySQL 5.0, Cluster supports only the READ COMMITTED transaction isolation level. Clustering in MySQL is supported only by the NDB storage engine. That is, in order for a table to be shared between nodes in a cluster, it must be created using ENGINE=NDB (or ENGINE=NDBCLUSTER, which is equivalent). It is possible to create tables using other storage engines (such as MyISAM or InnoDB) on a MySQL server being used for clustering, but these non-NDB tables will not participate in the cluster; they are local to the individual MySQL server instance on which they are created. Cluster is supported in all server binaries in the 5.0 release series for operating systems on which MySQL Cluster is available. See Section 5.2, “mysqld — The MySQL Server”. You can determine whether your server has NDB support using either the SHOW VARIABLES LIKE 'have_%' or SHOW ENGINES statement. You can also obtain NDB support by compiling MySQL from source, but it is not necessary to do so simply to use MySQL Cluster. To download the latest binary, RPM, or source distribution in the MySQL 5.0 series, visit http://dev.mysql.com/downloads/mysql/5.0.html. FULLTEXT indexing is not supported by the NDB storage engine in MySQL 5.0, or by any storage engine other than MyISAM. We are working to add this capability in a future release. It is possible but not advisable. One of the chief reasons to run a cluster is to provide redundancy. To enjoy the full benefits of this redundancy, each node should reside on a separate machine. If you place multiple nodes on a single machine and that machine fails, you lose all of those nodes. Given that MySQL Cluster can be run on commodity hardware loaded with a low-cost (or even no-cost) operating system, the expense of an extra machine or two is well worth it to safeguard mission-critical data. It also worth noting that the requirements for a cluster host running a management node are minimal. This task can be accomplished with a 200 MHz Pentium CPU and sufficient RAM for the operating system plus a small amount of overhead for the ndb_mgmd and ndb_mgm processes. It is acceptable to run multiple cluster data nodes on a single host for learning about MySQL Cluster, or for testing purposes; however, this is not supported for production use. Make a complete backup of all Cluster data. Completely shut down the cluster and all cluster node processes. Restart the cluster, using the --initial startup option. Restore all cluster data from the backup. In a future MySQL Cluster release series, we hope to implement a “hot” reconfiguration capability for MySQL Cluster to minimize (if not eliminate) the requirement for restarting the cluster when adding new nodes. However, this is not planned for MySQL 5.0. Temporary tables are not supported; a CREATE TEMPORARY TABLE statement using ENGINE=NDB or ENGINE=NDBCLUSTER fails with an error. FULLTEXT indexes and index prefixes are not supported. Only complete columns may be indexed. Spatial data types are not supported. See Chapter 16, Spatial Extensions. Only complete rollbacks for transactions are supported. Partial rollbacks and rollbacks to save points are not supported. The maximum number of attributes allowed per table is 128, and attribute names cannot be any longer than 31 characters. For each table, the maximum combined length of the table and database names is 122 characters. The maximum size for a table row is 8 kilobytes, not counting BLOB values. There is no set limit for the number of rows per table. Table size limits depend on a number of factors, in particular on the amount of RAM available to each data node. The NDB engine does not support foreign key constraints. As with MyISAM tables, these are ignored. For a complete listing of limitations in MySQL Cluster, see Section 15.11, “Known Limitations of MySQL Cluster”. You can import databases into MySQL Cluster much as you would with any other version of MySQL. Other than the limitations mentioned elsewhere in this FAQ and in Section 15.11, “Known Limitations of MySQL Cluster”, the only other special requirement is that any tables to be included in the cluster must use the NDB storage engine. This means that the tables must be created with ENGINE=NDB or ENGINE=NDBCLUSTER. It is also possible to convert existing tables using other storage engines to NDB Cluster using one or more ALTER TABLE statement, but this requires an additional workaround. See Section 15.11, “Known Limitations of MySQL Cluster”, for details. Cluster nodes can communicate via any of three different protocols: TCP/IP, SHM (shared memory), and SCI (Scalable Coherent Interface). Where available, SHM is used by default between nodes residing on the same cluster host; however, this is considered experimental in MySQL 5.0. SCI is a high-speed (1 gigabit per second and higher), high-availability protocol used in building scalable multi-processor systems; it requires special hardware and drivers. See Section 15.10, “Using High-Speed Interconnects with MySQL Cluster”, for more about using SCI as a transport mechanism in MySQL Cluster. If one or more nodes in a cluster fail, it is possible that not all cluster nodes will be able to “see” one another. In fact, it is possible that two sets of nodes might become isolated from one another in a network partitioning, also known as a “split brain” scenario. This type of situation is undesirable because each set of nodes tries to behave as though it is the entire cluster. When cluster nodes go down, there are two possibilities. If more than 50% of the remaining nodes can communicate with each other, we have what is sometimes called a “majority rules” situation, and this set of nodes is considered to be the cluster. The arbitrator comes into play when there is an even number of nodes: in such cases, the set of nodes to which the arbitrator belongs is considered to be the cluster, and nodes not belonging to this set are shut down. When all nodes in at least one node group are alive, network partitioning is not an issue, because no one portion of the cluster can form a functional cluster. The real problem arises when no single node group has all its nodes alive, in which case network partitioning (the “split-brain” scenario) becomes possible. Then an arbitrator is required. All cluster nodes recognize the same node as the arbitrator, which is normally the management server; however, it is possible to configure any of the MySQL Servers in the cluster to act as the arbitrator instead. The arbitrator accepts the first set of cluster nodes to contact it, and tells the remaining set to shut down. Arbitrator selection is controlled by the ArbitrationRank configuration parameter for MySQL Server and management server nodes. (See Section 15.4.4.4, “Defining the Management Server”, for details.) It should also be noted that the role of arbitrator does not in and of itself impose any heavy demands upon the host so designated, and thus the arbitrator host does not need to be particularly fast or to have extra memory especially for this purpose. MySQL Cluster supports all of the usual MySQL data types, with the exception of those associated with MySQL's spatial extensions. (See Chapter 16, Spatial Extensions.) In addition, there are some differences with regard to indexes when used with NDB tables. Note: MySQL Cluster tables (that is, tables created with ENGINE=NDBCLUSTER) have only fixed-width rows. This means that (for example) each record containing a VARCHAR(255) column will require space for 255 characters (as required for the character set and collation being used for the table), regardless of the actual number of characters stored therein. This issue is expected to be fixed in a future MySQL release series. See Section 15.11, “Known Limitations of MySQL Cluster”, for more information about these issues. Start the management node with the ndb_mgmd command. Start each data node with the ndbd command. Start each MySQL server (SQL node) using mysqld_safe --user=mysql &. Each of these commands must be run from a system shell on the machine housing the affected node. (You do not have to be physically present at the machine — a remote login shell can be used for this purpose.) You can verify that the cluster is running by starting the MGM management client ndb_mgm on the machine housing the MGM node and issuing the SHOW or ALL STATUS command. Either of these commands causes the ndb_mgm, ndb_mgm, and any ndbd processes to terminate gracefully. MySQL servers running as Cluster SQL nodes can be stopped using mysqladmin shutdown. For more information, see Section 15.7.2, “Commands in the MySQL Cluster Management Client”, and Section 15.3.6, “Safe Shutdown and Restart”. The data that was held in memory by the cluster's data nodes is written to disk, and is reloaded into memory the next time that the cluster is started. It can be helpful as a fail-safe. Only one MGM node controls the cluster at any given time, but it is possible to configure one MGM as primary, and one or more additional management nodes to take over in the event that the primary MGM node fails. See Section 15.4.4, “Configuration File”, for information on how to configure MySQL Cluster management nodes. Yes, so long as all machines and operating systems have the same “endianness” (all big-endian or all little-endian). It is also possible to use different MySQL Cluster releases on different nodes. However, we recommend this be done only as part of a rolling upgrade procedure (see Section 15.5.1, “Performing a Rolling Restart of the Cluster”). Yes, it is possible to do this. In the case of multiple data nodes, it is advisable (but not required) for each node to use a different data directory. If you want to run multiple SQL nodes on one machine, each instance of mysqld must use a different TCP/IP port. However, running more than one cluster node of a given type per machine is not supported for production use. Yes, it is possible to use DNS and DHCP for cluster hosts. However, if your application requires “five nines” availability, we recommend using fixed IP addresses. Making communication between Cluster hosts dependent on services such as DNS and DHCP introduces additional points of failure, and the fewer of these, the better. MySQL user accounts and privileges are not automatically propagated between different MySQL servers accessing the same MySQL Cluster. Therefore, you must make sure that these are copied between the SQL nodes yourself. 26.11.1: I have inserted CJK characters into my table. Why does SELECT display them as “?” characters? 26.11.2: What GB (Chinese) character sets does MySQL support? 26.11.3: What problems should I be aware of when working with the Big5 Chinese character set? 26.11.4: Why do Japanese character set conversions fail? 26.11.5: What should I do if I want to convert SJIS 81CA to cp932? 26.11.6: How does MySQL represent the Yen (¥) sign? 26.11.7: Do MySQL plan to make a separate character set where 5C is the Yen sign, as at least one other major DBMS does? 26.11.8: Of what issues should I be aware when working with Korean character sets in MySQL? 26.11.9: Why do I get Data truncated error messages? 26.11.10: Why does my GUI front end or browser not display CJK characters correctly in my application using Access, PHP, or another API? 26.11.11: I've upgraded to MySQL 5.0. How can I revert to behavior like that in MySQL 4.0 with regard to character sets? 26.11.12: Why do some LIKE and FULLTEXT searches with CJK characters fail? 26.11.13: What CJK character sets are available in MySQL? 26.11.14: How do I know whether character X is available in all character sets? 26.11.17: Why are my supplementary characters rejected by MySQL? 26.11.18: Shouldn't it be “CJKV”? 26.11.19: Does MySQL allow CJK characters to be used in database and table names? 26.11.20: Where can I find translations of the MySQL Manual into Chinese, Japanese, and Korean? 26.11.21: Where can I get help with CJK and related issues in MySQL? Make sure that a round trip possible — that is, when you select literal (or _introducer hexadecimal-value), you obtain literal as a result. If the result is not also ペ, then the round trip has failed. Use the mysql client program (on Windows: mysql.exe) to accomplish this task. If mysql displays correctly but your application doesn't, then your problem is probably due to system settings. These are typical character-set settings for an international-oriented client (notice the use of utf8 Unicode) connected to a server in the West (latin1 is a West Europe character set and a default for MySQL). Although Unicode (usually the utf8 variant on Unix, and the ucs2 variant on Windows) is preferable to Latin, it's often not what your operating system utilities support best. Many Windows users find that a Microsoft character set, such as cp932 for Japanese Windows, is what's suitable. MySQL supports the two common variants of the GB (Guojia Biaozhun, or National Standard) character sets which are official in the People's Republic of China: gb2312 and gbk. Sometimes people try to insert gbk characters into gb2312, and it works most of the time because gbk is a superset of gb2312 — but eventually they try to insert a rarer Chinese character and it doesn't work. (See Bug#16072 for an example). Here, we try to clarify exactly what characters are legitimate in gb2312 or gbk, with reference to the official documents. Please check these references before reporting gb2312 or gbk bugs. For a complete listing of the gb2312 characters, ordered according to the gb2312_chinese_ci collation: http://d.udm.net/bar/~bar/charts/gb2312_chinese_ci.html. MySQL's gbk is in reality “Microsoft code page 936”. This differs from the official gbk for characters A1A4 (middle dot), A1AA (em dash), A6E0-A6F5, and A8BB-A8C0. For a listing of the differences, see http://recode.progiciels-bpi.ca/showfile.html?name=dist/libiconv/gbk.h. For MySQL's listing of gbk characters, see http://d.udm.net/bar/~bar/charts/gbk_chinese_ci.html. A feature request for adding HKSCS extensions has been filed. People who need this extension may find the suggested patch for Bug#13577 to be of interest. In the following conversion table, the ucs2 column represents the source, and the sjis, cp932, ujis, and eucjpms columns represent the destinations — that is, the last 4 columns provide the hexadecimal result when we use CONVERT(ucs2) or we assign a ucs2 column containing the value to an sjis, cp932, ujis, or eucjpms column. This means that MySQL converts the NOT SIGN (Unicode U+00AC) to sjis code point 0x81CA and to cp932 code point 3F. (3F is the question mark (“?”) — this is what is always used when the conversion cannot be performed. Our answer is: “?”. There are serious complaints about this: many people would prefer a “loose” conversion, so that 81CA (NOT SIGN) in sjis becomes 81CA (FULLWIDTH NOT SIGN) in cp932. We are considering a change to this behavior. A problem arises because some versions of Japanese character sets (both sjis and euc) treat 5C as a reverse solidus (\ — also known as a backslash), and others treat it as a yen sign (¥). This is one possible solution to the Yen sign issue; however, this will not happen in MySQL 5.1 or 5.2. In theory, while there have been several versions of the euckr (Extended Unix Code Korea) character set, only one problem has been noted. MySQL's graphic Korean chart is here: http://d.udm.net/bar/~bar/charts/euckr_korean_ci.html. For illustration, we'll create a table with one Unicode (ucs2) column and one Chinese (gb2312) column. We'll try to place the rare character 汌 in both columns. Ah, there's a warning. Let's see what it is. So it's a warning about the gb2312 column only. There are several things that need explanation here. The fact that it's a “warning” rather than an “error” is characteristic of MySQL. We like to try to do what we can, to get the best fit, rather than give up. The 汌 character isn't in the gb2312 character set. We described that problem earlier. Admittedly the message is misleading. We didn't “truncate” in this case, we replaced with a question mark. We've had a complaint about this message (See Bug#9337). But until we come up with something better, just accept that error/warning code 2165 can mean a variety of things. With SQL_MODE=TRADITIONAL, there would be an error message, but instead of error 2165 you would see: ERROR 1406 (22001): Data too long for column 'gb2312' at row 1. In much the same way, if you are using any character set other than latin1 with Connector/NET, then you must specify the character set in the connection string. See Section 23.2.5.1, “Connecting to MySQL Using Connector/NET”, for more information. In this case, we used SET NAMES to change character_set_client and character_set_connection and character_set_results. Another issue often encountered in PHP applications has to do with assumptions made by the browser. Sometimes adding or changing a <meta> tag suffices to correct the problem: for example, to insure that the user agent interprets page content as UTF-8, you should include <meta http-equiv="Content-Type" content="text/html; charset=utf-8"> in the <head> of the HTML page. If you are using Connector/J, see Section 23.4.4.4, “Using Character Sets and Unicode”. The effect of this is that you cannot control the client character set by starting mysqld with --character-set-server=utf8. However, some of our Asian customers have said that prefer the MySQL 4.0 behavior. To make it possible to retain this behavior, we added a mysqld switch, --character-set-client-handshake, which can be turned off with --skip-character-set-client-handshake. If you start mysqld with --skip-character-set-client-handshake, then, when a client connects, it sends to the server the name of the character set that it wants to use — however, the server ignores this request from the client. As you can see by comparing the differing results from SHOW VARIABLES, the server ignores the client's initial settings if the --skip-character-set-client-handshake is used. If we don't know where the first character ends, then we don't know where the second character begins, in which case even very simple searches such as LIKE '_A%' fail. The solution is to use a regular CJK character set in the first place, or to convert to a CJK character set before comparing. This is one reason why MySQL cannot allow encodings of nonexistent characters. If it is not strict about rejecting bad input, then it has no way of knowing where characters end. For FULLTEXT searches, we need to know where words begin and end. With Western languages, this is rarely a problem because most (if not all) of these use an easy-to-identify word boundary — the space character. However, this is not usually the case with Asian writing. We could use arbitrary halfway measures, like assuming that all Han characters represent words, or (for Japanese) depending on changes from Katakana to Hiragana due to grammatical endings. However, the only sure solution requires a comprehensive word list, which means that we would have to include a dictionary in the server for each Asian language supported. This is simply not feasible. The majority of simplified Chinese and basic non-halfwidth Japanese Kana characters appear in all CJK character sets. This stored procedure accepts a UCS-2 Unicode character, converts it to all other character sets, and displays the results in hexadecimal. Since none of the column values is 3F — that is, the question mark character (?) — we know that every conversion worked. The official Unicode names (following the “#” mark) tell us the Japanese syllabary (Hiragana), the informal classification (letter, digit, or punctuation mark), and the Western identifier (KA or GA, which happen to be voiced and unvoiced components of the same letter pair). More importantly, the primary weight (the first hexadecimal number inside the square brackets) is 1E57 on both lines. For comparisons in both searching and sorting, MySQL pays attention to the primary weight only, ignoring all the other numbers. This means that we are sorting が and か correctly according to the Unicode specification. If we wanted to distinguish them, we'd have to use a non-UCA (Unicode Collation Algorithm) collation (utf8_unicode_bin or utf8_general_ci), or to compare the HEX() values, or use ORDER BY CONVERT(s1 USING sjis). Being correct “according to Unicode” isn't enough, of course: the person who submitted the bug was equally correct. We plan to add another collation for Japanese according to the JIS X 4061 standard, in which voiced/unvoiced letter pairs like KA/GA are distinguishable for ordering purposes. For ucs2 and utf8, the default collation is “general”. To specify a Unicode collation, use COLLATE ucs2_unicode_ci. MySQL does not support supplementary characters — that is, characters which need more than 3 bytes — for UTF-8. We support only what Unicode calls the Basic Multilingual Plane / Plane 0. Only a few very rare Han characters are supplementary; support for them is uncommon. This has led to reports such as that found in Bug#12600, which we rejected as “not a bug”. With utf8, we must truncate an input string when we encounter bytes that we don't understand. Otherwise, we wouldn't know how long the bad multi-byte character is. One possible workaround is to use ucs2 instead of utf8, in which case the “bad” characters are changed to question marks; however, no truncation takes place. You can also change the data type to BLOB or BINARY, which perform no validity checking. We intend at some point in the future to add support for UTF-16, which would solve such issues by allowing 4-byte characters. However, we have as yet set no definite timetable for doing so. No. The term “CJKV” (Chinese Japanese Korean Vietnamese) refers to Vietnamese character sets which contain Han (originally Chinese) characters. MySQL has no plan to support the old Vietnamese script using Han characters. MySQL does of course support the modern Vietnamese script with Western characters. Bug#4745 is a request for a specialized Vietnamese collation, which we might add in the future if there is sufficient demand for it. This issue is fixed in MySQL 5.1, by automatically rewriting the names of the corresponding directories and files. For example, if you create a database named 楮 on a server whose operating system does not support CJK in directory names, MySQL creates a directory named @0w@00a5@00ae. which is just a fancy way of encoding E6A5AE — that is, the Unicode hexadecimal representation for the 楮 character. However, if you run a SHOW DATABASES statement, you can see that the database is listed as 楮. A Simplified Chinese version of the Manual, current for MySQL 5.1.12, can be found at http://dev.mysql.com/doc/#chinese-5.1. The Japanese translation of the MySQL 4.1 manual can be downloaded from http://dev.mysql.com/doc/#japanese-4.1. A listing of MySQL user groups can be found at http://dev.mysql.com/user-groups/. Visit the MySQL Character Sets, Collation, Unicode Forum. We are also in the process of adding foreign-language forums at http://forums.mysql.com/. For answers to common queries and question regarding Replication within MySQL, see Section 6.10, “Replication FAQ”. In the following section, we provide answers to questions that are most frequently asked about Distributed Replicated Block Device (DRBD). 26.14.1.2: What are “Block Devices”? 26.14.1.3: How is DRBD licensed? 26.14.1.4: Where can I download DRBD? 26.14.1.5: If I find a bug in DRBD, to whom do I submit the issue? 26.14.1.6: Where can I get more technical and business information concerning MySQL and DRBD? DRBD is an acronym for Distributed Replicated Block Device. DRBD is an open source Linux kernel block device which leverages synchronous replication to achieve a consistent view of data between two systems, typically an Active and Passive system. DRBD currently supports all the major flavors of Linux and comes bundled in several major Linux distributions. The DRBD project is maintained by LINBIT. Block devices are the type of device used to represent storage in the Linux Kernel. All physical disk devices present a “block device” interface. Additionally, virtual disk systems like LVM or DRBD present a “block device” interface. In this way, the file system or other software that might want to access a disk device can be used with any number of real or virtual devices without having to know anything about their underlying implementation details. DRBD is licensed under the GPL. Bug reports should be submitted to the DRBD mailing list. Please see: http://lists.linbit.com/ . In the following section, we provide answers to questions that are most frequently asked about Linux Heartbeat. 26.14.2.1: What is Linux Heartbeat? 26.14.2.2: How is Linux Heartbeat licensed? 26.14.2.3: Where can I download Linux Heartbeat? 26.14.2.4: If I find a bug with Linux Heartbeat, to whom do I submit the issue? The Linux-HA project (http://www.linux-ha.org/) offers a high availability solution commonly referred to as Linux Heartbeat. Linux Heartbeat ships as part of several Linux distributions, as well as within several embedded high availability systems. This solution can also be used for other applications besides databases servers, such as mail servers, web servers, file servers, and DNS servers. Linux Heartbeat implements a heartbeat-protocol. A heartbeat-protocol means that messages are sent at regular intervals between two or more nodes. If a message is not received from a node within a given interval, then it is assumed the node has failed and some type of failover or recovery action is required. Linux Heartbeat is typically configured to send these heartbeat messages over standard Ethernet interfaces, but it does also support other methods, such as serial-line links. Linux Heartbeat is licensed under the GPL. Bug reports should be submitted to http://www.linux-ha.org/ClusterResourceManager/BugReports. In the following section, we provide answers to questions that are most frequently asked about DRBD Architecture. 26.14.3.1: Is an Active/Active option available for MySQL with DRBD? 26.14.3.2: What MySQL storage engines are supported with DRBD? 26.14.3.3: How long does a failover take? 26.14.3.4: How long does it take to resynchronize data after a failure? Currently, MySQL does not support Active/Active configurations using DRBD “out of the box”. All of the MySQL transactional storage engines are supported by DRBD, including InnoDB and Falcon. For archived or read-only data, MyISAM or Archive can also be used. Failover time is dependent on many things, some of which are configurable. After activating the passive host, MySQL will have to start and run a normal recovery process. If the InnoDB log files have been configured to a large size and there was heavy write traffic, this may take a reasonably long period of time. However, under normal circumstances, failover tends to take less than a minute. Resynchronization time depends on how long the two machines are out of communication and how much data was written during that period of time. Resynchronization time is a function of data to be synced, network speed and disk speed. DRBD maintains a bitmap of changed blocks on the primary machine, so only those blocks that have changed will need to be transferred. In the following section, we provide answers to questions that are most frequently asked about MySQL Replication Scale-out. 26.14.4.1: What is the difference between MySQL Cluster and DRBD? 26.14.4.2: What is the difference between MySQL Replication and DRBD? 26.14.4.3: How can I combine MySQL Replication scale-out with DRBD? Both MySQL Cluster and DRBD replicate data synchronously. MySQL Cluster leverages a shared-nothing storage architecture in which the cluster can be architected beyond an Active/Passive configuration. DRBD operates at a much lower level within the “stack”, at the disk I/O level. For a comparison of various high availability features between these two options, please refer to Figure A.1, “Availability comparison”. 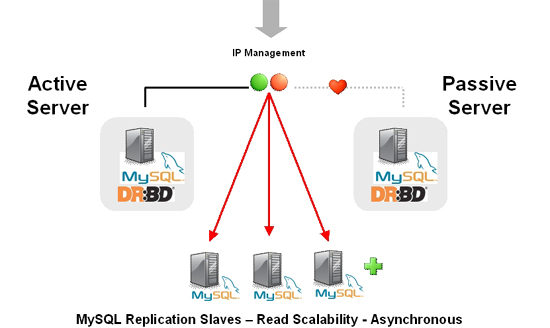 MySQL Replication replicates data asynchronously while DRBD replicates data synchronously. For a comparison of various high availability features between these two options, please refer to the high availability comparison grid, Figure A.1, “Availability comparison”. MySQL Replication is typically deployed in a Master to many Slaves configuration. In this configuration, having many Slaves provides read scalability. DRBD is used to provide high-availability for the Master MySQL Server in an Active/Passive configuration. This provides for automatic failover, safeguards against data loss, and automatically synchronizes the failed MySQL Master after a failover. The most likely scenario in which MySQL Replication scale-out can be leveraged with DRBD is in the form of attaching replicated MySQL “read-slaves” off of the Active-Master MySQL Server, shown in Figure A.2, “Active-Master MySQL server”. Since DRBD replicates an entire block device, master information such as the binary logs are also replicated. In this way, all of the slaves can attach to the Virtual IP Address managed by Linux Heartbeat. In the event of a failure, the asynchronous nature of MySQL Replication allows the slaves to continue with the new Active machine as their master with no intervention needed. In the following section, we provide answers to questions that are most frequently asked about DRBD and file systems. 26.14.5.1: Can XFS be used with DRBD? Yes. XFS uses dynamic block size, thus DRBD 0.7 or later is needed. In the following section, we provide answers to questions that are most frequently asked about DRBD and LVM. 26.14.6.1: Can I use DRBD on top of LVM? 26.14.6.2: Can I use LVM on top of DRBD? 26.14.6.3: Can I use DRBD on top of LVM while at the same time running LVM on top of that DRBD? Yes, DRBD supports on-line resizing. If you enlarge your logical volume that acts as a backing device for DRBD, you can enlarge DRBD itself too, and of course your file system if it supports resizing. Yes, you can use DRBD as a Physical Volume (PV) for LVM. Depending on the default LVM configuration shipped with your distribution, you may need to add the /dev/drbd* device files to the filter option in your lvm.conf so LVM scans your DRBDs for PV signatures. This requires careful tuning of your LVM configuration to avoid duplicate PV scans, but yes, it is possible. In the following section, we provide answers to questions that are most frequently asked about DRBD and virtualization. 26.14.7.1: Can I use DRBD with OpenVZ? 26.14.7.2: Can I use DRBD with Xen and/or KVM? Yes. If you are looking for professional consultancy or expert commercial support for Xen- or KVM-based virtualization clusters with DRBD, contact LINBIT (http://www.linbit.com). In the following section, we provide answers to questions that are most frequently asked about DRBD and security. 26.14.8.1: Can I encrypt/compress the exchanged data? 26.14.8.2: Does DRBD do mutual node authentication? Yes. But there is no option within DRBD to allow for this. You’ll need to leverage a VPN and the network layer should do the rest. Yes, starting with DRBD 8 shared-secret mutual node authentication is supported. In the following section, we provide answers to questions that are most frequently asked about DRBD and System Requirements. 26.14.9.1: What other packages besides DRBD are required? 26.14.9.2: How many machines are required to set up DRBD? 26.14.9.3: Does DRBD only run on Linux? Pre-built x86 and x86_64 packages for specific kernel versions are available with a support subscription from LINBIT. Please note that if the kernel is upgraded, DRBD must be as well. Two machines are required to achieve the minimum degree of high availability. Although at any one given point in time one will be primary and one will be secondary, it is better to consider the machines as part of a mirrored pair without a “natural” primary machine. DRBD is a Linux Kernel Module, and can work with many popular Linux distributions. DRBD is currently not available for non-Linux operating systems. In the following section, we provide answers to questions that are most frequently asked about DRBD and resources. 26.14.10.1: Does MySQL offer professional consulting to help with designing a DRBD system? 26.14.10.2: Does MySQL offer support for DRBD and Linux Heartbeat from MySQL? 26.14.10.3: Are pre-built binaries or RPMs available? 26.14.10.4: Does MySQL have documentation to help me with the installation and configuration of DRBD and Linux Heartbeat? 26.14.10.5: Is there a dedicated discussion forum for MySQL High-Availability? 26.14.10.6: Where can I get more information about MySQL for DRBD? Yes. MySQL offers consulting for the design, installation, configuration, and monitoring of high availability DRBD. For more information concerning a High Availability Jumpstart, please see: http://www.mysql.com/consulting/packaged/scaleout.html. Yes. Support for DRBD is available with an add-on subscription to MySQL Enterprise called “DRBD for MySQL”. For more information about support options for DRBD see: http://mysql.com/products/enterprise/features.html. For the list of supported Linux distributions, please see: http://www.mysql.com/support/supportedplatforms/enterprise.html. NOTE: DRBD is only available on Linux. DRBD is not available on Windows, MacOS, Solaris, HPUX, AIX, FreeBSD, or other non-Linux platforms. Yes. “DRBD for MySQL” is an add-on subscription to MySQL Enterprise, which provides pre-built binaries for DRBD. For more information see: http://mysql.com/products/enterprise/features.html. For more information about MySQL for DRBD, including a technical white paper please see: DRBD for MySQL High Availability.